Morano: "It is obvious Mr. Kimmel has not seen 'Climate Hustle' or he would have known better than to recite the same propaganda litany of climate 'facts' which the movie deals with head-on. Using a video of cursing scientists warning of a tired litany of doom, using terms like 'apocalyptic'; 'catastrophic'; and 'extremely dire' was bland and predictable and the very reason that ‘Climate Hustle’ was made. "Apparently, Kimmel thinks failure to believe in man-made global warming fears is akin to not believing in gravity or yogurt. Odd. “Mr. Kimmel, I challenge you to watch 'Climate Hustle' and issue an apology for your climate pabulum that you spewed to viewers. 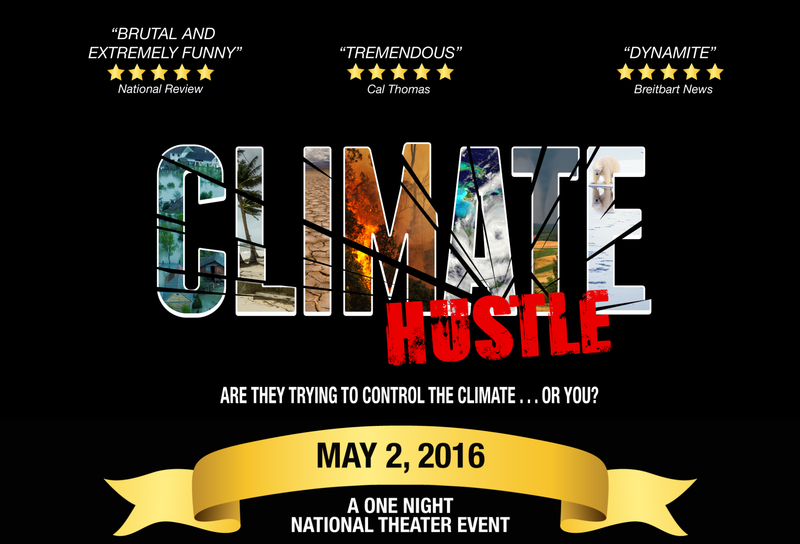 'Climate Hustle' was made to counter the very boilerplate rants that you, Mr. Kimmel, engaged in. The public needs to view 'Climate Hustle' if, for no other reason, than to hear Mr. Kimmel's climate talking points dismantled. Now back to your regularly scheduled programming." When critics trash a film, they’ve usually actually seen it – but, not ABC’s Jimmy Kimmel. So, the filmmaker of movie debunking climate hysteria is challenging Kimmel to attend a private screening. The “Jimmy Kimmel Live!” host used seven minutes of his Monday show to mock a climate skeptic’s film he obviously hadn’t seen – since he repeats the very alarmist talking points the film debunks. Kimmel bashed “Climate Hustle,” a climate skeptic film that aired in 400 theaters nationwide Monday, by making misleading, unsupportable, and inaccurate claims, and personally attacking Gov. Sarah Palin for supporting the film. He then aired a two-minute climate change advocacy “message” featuring scientists dropping the “F-Bomb” to insult anyone skeptical of man-made climate change. Kimmel’s rant against “Climate Hustle” displays a complete ignorance of the content of the film – and deploys the same shopworn deceitful and mean-spirited tactics the film exposes and addresses. Renowned dissenting scientists (including a Nobel Laureate and a moon-mission astronaut) share data and analysis debunking climate hysteria – not the ignorant, average slobs Kimmel accuses his dissenting viewers of being. In response to Kimmel’s uninformed, agenda-driven rant on national television, “Climate Hustle” producer, writer and host Marc Morano is challenging Kimmel to view the film. “It is obvious Mr. Kimmel has not seen ‘Climate Hustle’ or he would have known better than to recite the same propaganda litany of climate ‘facts’ which the movie deals with head-on. Using a video of cursing scientists warning of a tired litany of doom, using terms like ‘apocalyptic’; ‘catastrophic’; and ‘extremely dire’ was bland and predictable and the very reason that ‘Climate Hustle’ was made. “Apparently, Kimmel thinks failure to believe in man-made global warming fears is akin to not believing in gravity or yogurt. Odd. “Mr. Kimmel, I challenge you to watch ‘Climate Hustle’ and issue an apology for your climate pabulum that you spewed to viewers. ‘Climate Hustle’ was made to counter the very boilerplate rants that you, Mr. Kimmel, engaged in. The public needs to view ‘Climate Hustle’ if, for no other reason, than to hear Mr. Kimmel’s climate talking points dismantled. “If Jimmy Kimmel is actually interested in the facts, he’ll step up and watch the film, instead of continuing to recite inaccurate, fear-mongering clichés on blind faith,” Morano added. “Ninety-seven percent of climate scientists agree on this. And 97 percent of scientists don’t agree on much. Even one out of five dentists don’t believe in sugarless gum for their patients that chew gum. But Almost half our representatives in Washington apparently know more about science than our scientists, or they pretend to because big corporations give them a lot of money to make sure they can keep doing the destructive things that they do. And the idea that this is some kind of left wing conspiracy is — what if I decided to deny the existence of yogurt? Think about it. I’ve seen the containers, I just don’t believe there’s anything in them. I believe yogurt is a conspiracy created by John Stamos. You’d think I was insane, and I would be insane, but this is not that different from that. To me the big question is, either you believe in science or you don’t. Why do we believe scientists when it comes to molecules and the speed of light and Cialis, but not this? Because members of Congress, who we don’t even like, by the way, because people who take money from companies that make pollution for a living told us not to worry about it. Now, and I know I’ll get beaten over the head by every wacko website, and I know there will be a lot of what the hell do you know, go back to girls jumping on trampolines. This is not about what I know, this is about what scientists know. So I hope that for the next two minutes, put your political leanings aside, forget about whether you’re a Republican or a Democrat, forget the labels, and pay attention to the following message. Decide for yourself, the people you’re about to see are scientists, they’re Americans, they’re not part of some imaginary conspiracy, they’re just a smarter version of us. Watch this, and if at the end you disagree, while we’re all underwater I hope you’ll be that last one that gets a snorkel. ARADHNA TRIPATI: Hi, I’m Aradhna Tripati, I’m a paleoclimatologist and isotope geochemist. ALEX HALL: Hi, I’m Alex Hall, and I’m a climate scientist. JEREMY PAL: I’m Jeremy Pal, and I’m a hydroclimatologist. NINA KARNOVSKY: I’m Nina Karnovsky, and I’m a polar ecologist. CHUCK TAYLOR: I’m Chuck Taylor, and I’m an environmental analytical chemist. JOHN DORSEY: I’m John Dorsey, and I’m a marine environmental scientist. KARNOVSKY: Over the past 40 years, thousands of scientists have studied climate change. TRIPATI: And it’s caused by human beings. PAL: That’s you and me. HALL: And the consequences could be extremely dire. TRIPATI: And here’s the thing, when we tell you all this, we’re not f***ing with you. PAL: We’re not f***ing with you. TAYLOR: Definitely not f***ing with you. DORSEY: Why would we f*** with you? HALL: If I wanted to screw with people, do you think I would have gone into climate science? DORSEY: If we were f***ing with you I’m sure we could do a lot better than anthropogenic climate change. TRIPATI: I’d probably tell you that a meteor was coming, and then try to sell you a helmet.